financial district of Toronto, Ontario, Canada. This morning we left Niagara Falls for our next location Toronto - Canada's most densely populated city. Before we left Niagara Falls we headed out for a quick bite to eat - which we found at Applebee's and we both enjoyed a hearty breakfast. We found it interesting when it came time to pay, as usual we checked over the bill and found a "new tax" called DMF which is a destination marketing fee. Apparently this tax is only charged in Niagara Falls and is applied to food as far as we could ascertain. So it now seems that the very same advertising that attracts tourists to Niagara Falls is now actually paid for by same tourists. That totally stinks!! We left Niagara Falls and headed towards Toronto - for the next two days. 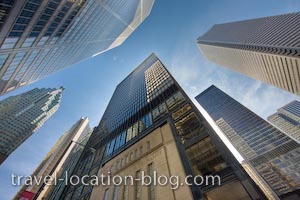 The High Rise buildings in the Financial District and Toronto-Dominion Centre of downtown Toronto, Ontario, Canada.